A dense, rounded, very symmetrically growing tree. The effect is very formal. The foliage is a dark green in the summer, changing to yellow in the fall. The leaves are slightly smaller than other Norway maples. Produced by top grafting on seedlings. 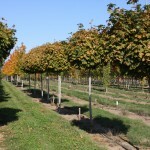 It is tolerant of a wide range of soils, heat and drought. It performs best in full sun.